GotPhoto automates tiresome admin tasks for you from start to finish. We work the magic. You get the applause. The site takes your customers through the order process step by step, making online orders easy and stress-free. The online shop is accessible from all devices and can be personalised to you and your branding. Offer your customers additional incentives, like savings bundles and digital downloads, or even the opportunity to personalise their own products. Registration and individual access codes are secure ensuring that parents only see photos of their own children. The entire shop is SSL-locked to encrypt and secure transmitted data. Sell downloads and popular photo products. With our four partner labs, there is a huge range of products to choose from to suit any customer. You choose what prices you want to offer. We only charge the purchasing costs and a small service fee. Your customers can pay via Stripe, Paypal, debit and credit cards. You decide what options to offer – the ball is in your court. We offer handy bundles of the most popular products for a great price. 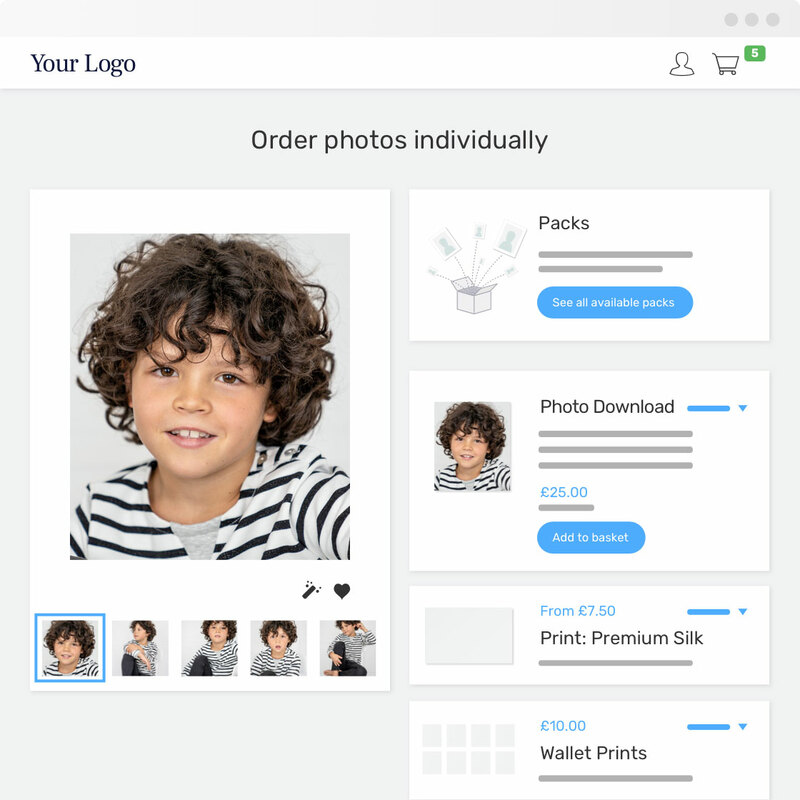 Within the online shop, your customers can pick and choose which photos they want in their package. Offer your customers the option to receive their photos as high-quality, digital files. Your customers can download their photos immediately after payment. 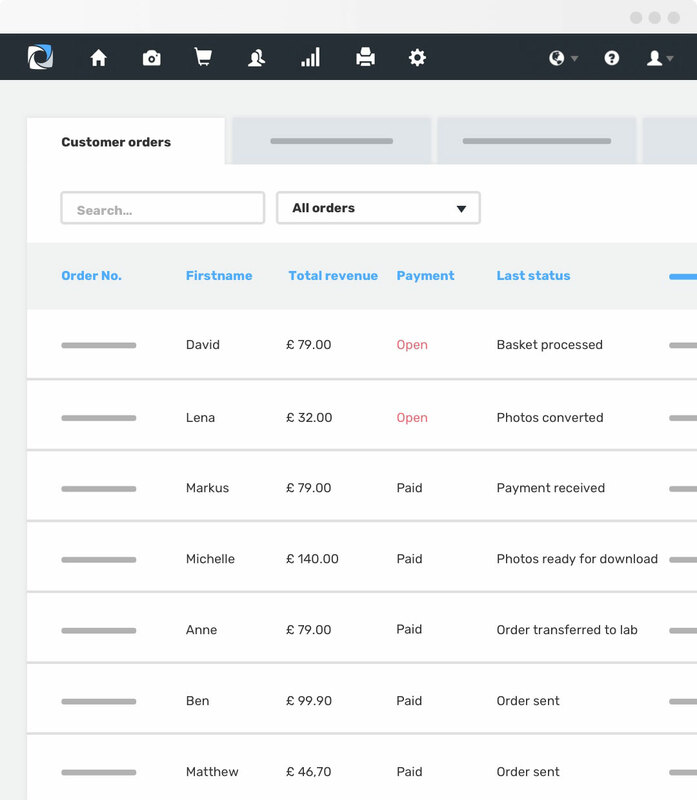 With just one click, your customers can download their complete gallery as a bundle. It couldn’t be easier. Upload your own logo and choose your site colors. You can also decide whether you want your shop to display in light or dark mode. Use our GotPhoto domain (e.g. www.yourname.GotPhoto.com), or connect your shop with an existing domain. Offer various languages for your site, including English, Spanish, German, or French. Each customer can pick their preferred language. Create as many subpages as you like with our integrated Content Management System. For example, you can create a portfolio or share important information with your customers. If you activate this feature, your customers can use various effects (e.g. B&W filters, sepia) before putting photos in their basket. We send the chosen effect straight to the lab. Your customers can collect their favorite photos in one wish list and share it with friends and family. For certain products, like birthday or greetings cards, your customers can add their own personalized message before adding to their basket. Leave choosing photos for school IDs and yearbooks to your customers. There is an option for you to “pick your favorite photo” yourself from the series in Lightroom. Have a look at our demo shop – login with the password “demo” and test the functionality. We believe that photographers should be able to spend more time behind the lens, not behind a desk. That’s why our workflow is optimised for high-volume jobs with lots of customers – from shooting with QR cards to automatic billing. This means your time spent in the office is cut in half, and you can concentrate fully on your creative ideas. A unique access card with its own QR code is attached to every new photo series. Each photo series is then automatically assigned to each child upon uploading. The access card also serves as the parents’ key to access the online shop later. We match every payment to the correct order for you, so they can go straight to production. Customer orders are passed right onto the labs after payment, and the labs deliver the finished products directly to the customers. That means there is no need for unnecessary middle men. You have the option to outsource your photo selection and editing to GotPhoto. Our professional photo editors optimise the photos to your exact wishes based on reference photos from you. In the pricing profile, you decide what you want to sell at what price. You can change your prices later on if necessary. For a fast and simple start, you can also use our pricing suggestions. Are you working with multiple photographers? If so, you have the opportunity to assign tasks to other colleagues. For example, they can save you time by uploading their photos themselves. If you have a list of names in advance of a shoot, you can upload the names and print out the QR cards ahead of time. They will be ready to go with the corresponding child’s name. This feature is particularly useful for creating school IDs. As an alternative to QR tagging, we also offer the option to integrate existing tethered shooting software into our system. This enables you to scan our access cards via barcodes. Alongside standard photo uploads direct from the browser, we offer another possibility: our Lightroom plug-in is available via FTP, or ‘EasyUpload’ is our own development for Windows or Mac. You can also decide which colleagues can upload photos for each job. You have the option to outsource your photo selection and editing to GotPhoto.com. Our professional photo editors optimize the photos to your exact wishes based on your reference photos. We protect your photos from becoming screenshots. You can either use our watermark suggestion or design your own. Of course, your customers receive their photos free from watermarks. We match every payment to the correct order for you, so they can go straight to production. Customer orders are passed right onto the labs after payment, and the labs deliver the finished products directly to the customers. You don’t have to be an unnecessary middleman. You won’t need to create any bills by hand – we will provide them in your name, complete with your logo and letterhead. If you’d like, you can order photos in your own name and have them delivered to yourself. We only charge the production costs and don’t send any invoices to the customer. We choose our partner labs according to strict criteria and regularly check the quality and return rates. You can be sure that your customers will only receive the best. High-volume photographers can use our EasyLab software to integrate local mini-labs from Nortsu, Fujifilm and Epson with GotPhoto.com. Incoming orders are automatically downloaded, converted and sent to the lab. Creating school IDs couldn’t be easier with us. Simply upload the list of student names and our QR tagging system assigns the photos to the corresponding student. You can export the students’ data and photos in various formats. In case something goes wrong with an order, customers can ask for a refund in the online shop. Depending on the reason, this claim will be shared with you, with us and/or directly with the labs for further attention. Because you’re not restricted to a photo gallery, you can present more of your photos to parents. As a rule, this creates more sales. All important information and updates are sent automatically via email or text, so nothing gets lost. You can boost your sales even further with vouchers or specialised offers, like holiday sales. All parents register themselves with their email address or phone number to their order. If the photos are not yet available in the system, this data will be connected to the right photos when they are uploaded. Later on, you can send potential customers reminders to order or vouchers to increase your sales. Automatically send potential customers notifications via email or text. You identify specific triggers for each job. Some examples include: a notification as soon as the photos are available; a reminder to order photos 2 weeks after they are available; or an alert three days before a voucher expires. You receive sales evaluations and data from online shop visitors for every job. This means you can see how your jobs develop and where they can improve. This data can also be connected to Google Analytics. Create contact sheets to hand out after photo day with small preview photos and individual access codes for everyone photographed. Distribute these at the school or kindergarten to remind parents to order. Vouchers work perfectly as order incentives. Once an coupon has been created, the discount is printed on the QR cards and shown as a countdown within the online shop. With just a few clicks, you can decide the type and value of the voucher. You can also create specific voucher codes. To increase sales, we offer the opportunity to install scaled discounts based on order quanity. The discount itself increases according to the order volume – the more products ordered, the higher the discount. Make use of our various upselling options and increase profits. For example, after a savings bundle is chosen, you can offer your customers added extras, like digital downloads, for a low additional cost. All data for potential or existing customers are saved in your integrated customer data bank. Use the stored contact information to send your customers reminders or vouchers to boost sales. In addition to the communications profile (automated notifications), you can send your customers a classic newsletter, personalized with your logo, perfectly suited to promote action around Christmas or Valentine’s Day. With this in mind, we help out with various smart placeholders that you can easily customize with your own text, such as the name of your customer, individual order links and preview photos. Create contact sheets after photo day with small preview photos and individual access codes for everyone photographed. Share these shortcuts in the school or kindergarten to remind parents to order. This means you can then embed photo previews of your customers in every email with just one click. We offer integrated SEO tools that make it easier for your customers to find you online. Increase your reach by connecting Facebook, Twitter and Google Plus. After photo day, parents will receive an access card from you. It provides them with the address of your online shop, the access code and a voucher, complete with an expiry date. For such an important point of contact, an appealing and understandable design is crucial. We have optimized various templates with the help of valuable customer feedback over the years. You can also upload your own design tailored to your specifications. Use all features with no restrictions. No credit card needed. Start out with GotPhoto for free now.